If you are prone to sports injuries, there are two activities I’d suggest for you. The first would be swimming. It’s always my suggestion for people who want to lose weight but have issues (joints, knee injuries, back pain, etc) but I’m biased because I love swimming. The other alternative is cycling. Cycling is a very body-friendly activity and a good way to get fit without getting hurt. 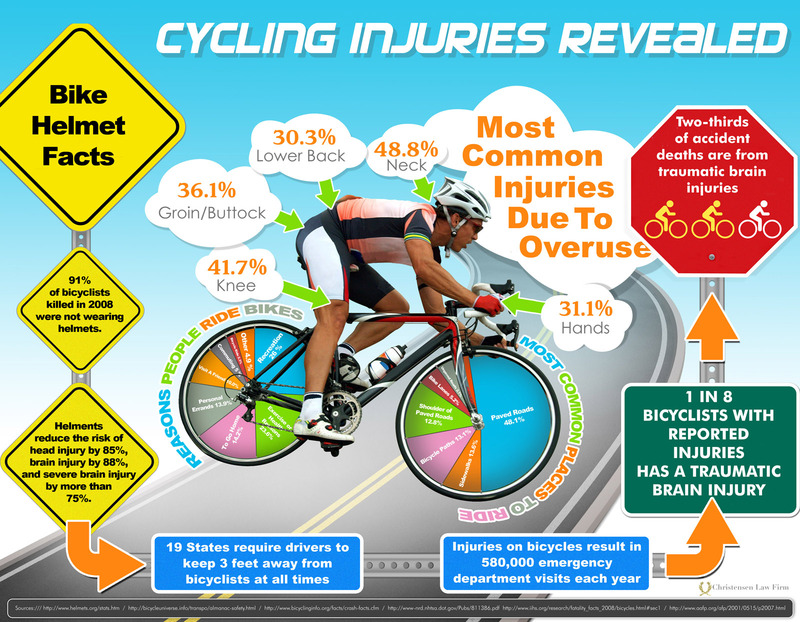 With cycling, though, the injuries are fairly limited as long as we do a few things right. (Read Bike Buying Mistakes) Obviously follow the rules of the road, pay attention to cars around you, wear a HELMET at all times on the bike, and wear reflective clothing. Continue reading for more tips. The first thing is crucial: get a proper bike fitting. Don’t ride a bike that isn’t right for your body. You’ll regret it (and so will your lower back) if you don’t get fitted! Strengthen your core. Strength training is so crucial and I noticed that when I spent a good amount of time weight training that all my other sports improved tremendously. Balance in the body is key! A strong core will make those long bike rides much easier, more comfortable and you won’t be sore afterward. Another common injury is saddle sores. I never really had this issue, even as a newbie rider, but I did have soreness. The tip to overcome this: good cycling shorts. They also make creams to put on your nether-regions before biking long miles to prevent chafing. It’s uncomfortable but they work. The other body issues that can come up are really about tension. Is your neck and shoulders sore the day after a ride? Check your posture on the bike. Are your toes going numb? Maybe your shoes are too tight, or you need to wiggle your toes periodically while riding. Are your hands and wrists hurting? Maybe you’re gripping the handle bars too tightly. Just being aware of your body while riding can help a lot of issues. Just like with running, you don’t want to do too many miles too soon. A friend of mine who has started biking recently asked me about the “cycling marathons” I do. 🙂 I had to laugh at that terminology. It reminded me that maybe not everyone knows that a Century means 100 miles on the bike! My friend wanted to do a Century with her friend and when I told her that meant 100 miles she was like…um, no thanks! You don’t go from biking once in awhile to completing 100 miles! When I first started commuting to work, I did part of the route. It ended up being about 11 miles roundtrip to and from work. That was a good starting point. As I got better, as I got more comfortable and more confident on the bike, I tried biking the full route–22 miles roundtrip. It took some time. I’m glad I took it slowly and built my endurance up. This year I didn’t need to do that because I spent all winter in spin class! If you follow some of these tips, I think you’ll be much happier on the bike and your body will thank you! QUESTION: What are some of your “body aches” after cycling? My body aches really only come from the longer rides. I get some tension in my shoulders. My thighs do get tired as well, but you just can’t avoid that on really long rides. I average about 80 miles a week on my bike and you still get aches and pains. The worst stuff happens when I hit an unexpected bump and didn’t get a chance to loosen my grip. That always ends up really hurting my wrists. We won’t talk about the scrapes and bruises from falling over LOL! Good suggestion. I’ve learned to loosen my grip on the bars when going over speed bumps and other stuff and it helps a lot. The last few weeks I’ve been having back pain during my rides. I think I need to have my seat re-adjusted soon. Great tips! I really want to get back on my bike… but I hate it and need to save for a new one. Worst purchase ever. Live and learn, right? I also very much relate to the ‘tention’ tip, espeically when it comes to hand/wrist pain. My add-on to it would be that if you have pain for too long, get it check out! I hurt my wrist gripping my handle bars too tightly while racing home in a thunder storm two year ago, and I’ve now lost range of motion in my wrist because I never got it looked at, thinking the pain would just go away. Great tip! YES, don’t ignore lingering aches and pains. Get them checked out. Great post! In fact, I just got my bike fitted last night, despite having it for a year and a half so far, so very timely for me. Good job! Did your bike need a lot of adjustments? This is perfect timing for me – I’m itching to get biking this Summer. I don’t put on enough miles to get saddle soreness but I do get lots of tension in my shoulders and arms – basically because my bike has me lean over quite a bit. Better for speed, not too great on the arms! The shoulders and arm soreness is common. I get upper shoulder/neck soreness after really long rides. I bet it’s posture. I just recently bought a rode bike and so far I LOVE it! I do notice that my hands and fingers tend to get a little numb. Maybe its because I am gripping the handle bars too tightly? I am a little fearful because this is the first bike that I have where I have the clipless peddles so I am probably giving the handle bars the death grip. I do LOVE biking though. That’s so great! What kind of bike did you get? Yes, the numbness in hands, arms, etc is usually from gripping too tightly. You should also change your hand positions frequently on long rides to prevent pain and stiffness in arms/elbows/shoulders etc. Clip in pedals take awhile to get used to. I am still sometimes nervous using them! I treated myself to a Trek Lexa S. I was able to get a “good” deal on it because it was last year’s model. I am truly enjoying it. Fantastic! There is NOTHING wrong with last year’s model. When I bought my road bike I got last year’s model on clearance. Saved me over $200! Tension, yes, but also pressure that can cause nerve injury to the hand and to the contact area with the seat. Really important as you noted more recently to make adjustments and changes as soon as you notice a problem, to avoid bigger problems. Yes! Don’t wait! I waited too long to fix my seat recently. I kept thinking it would get better (stupid mistake).